We live in an age where we like everything just right, be it a holiday, a family outing, a party, even our gardens and driveways. When it comes to 'just rightness' nothing more has to be spot on more than our homes and interiors. So when it comes to a rug, we're usually looking for a soft furnishing that brings a room together, not only by design and shades, but also texture. This is what our Sorrento and Portofino range is all about, making a decor just right. 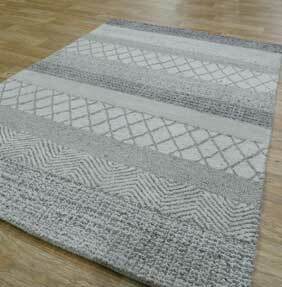 This range showcases 4 rugs, each made in three stocked sizes, bespoke sizes are available to order.